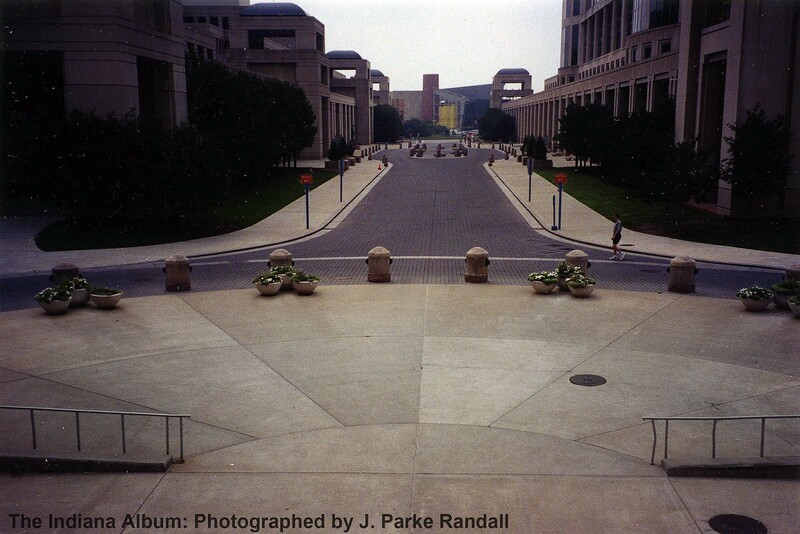 J. Parke Randall was a young architect in Indianapolis in 1953 when he received an assignment from his boss Edward D. Pierre: photographically document downtown areas for the Crossroads of American redevelopment plan. Pierre, a forward-thinking architect with a city planner’s mindset, had been hired to design a city for the future with areas designated for entertainment, transportation, government, and even fashion. Read Libby Cierzniak’s detailed article about the plan that never came to be. New to the city as a recent architecture graduate from Washington University in St. Louis, Randall was the first tenant to move into the new Essex House Apartments at 100 E. Vermont Street. 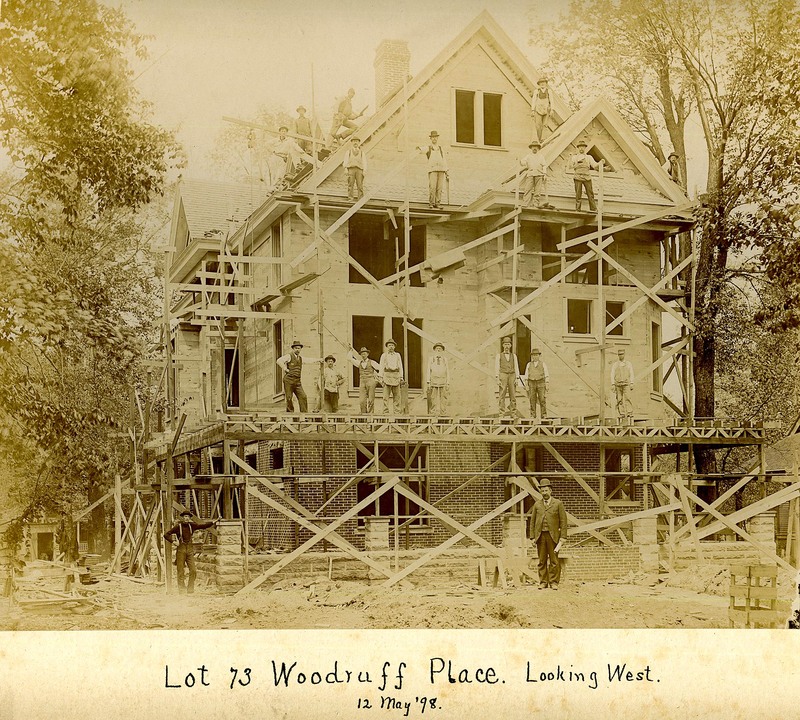 He outfitted his closet as a darkroom and made black-and-white prints of sections of the city slated for renovation including City Market, the canal, and the streets near the Indiana State House. One of the Randall’s most unrecognizable images, to anyone who wasn’t around in the 1950s, is this view looking west from the State House at the 300 block of W. Market Street. Senate Avenue is in the foreground. 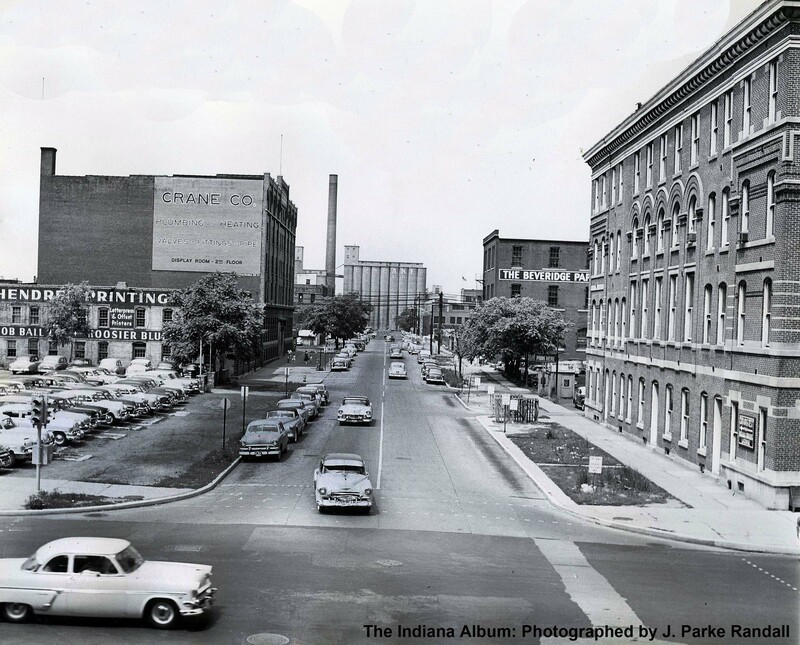 The block was home to a hodge-podge of commercial and industrial buildings, including left to right: a printing company, the 1911 Crane Company (plumbers’ supplies) building, the Beveridge Paper Company factory (previously used by the American Brewing Company), and to the right the State House Annex (formerly the Medical College of Indiana and Bobbs’ Free Dispensary). In the distance are the silos for the Acme Evans Mill. This circa 1960 aerial photograph looks southwest at the street shortly after the State Office Building had been constructed. A little over fifty years later, Randall rephotographed the sites to document the changes. Although most of Edward Pierre’s Crossroads plans had not come to fruition, the area west of the State House is now a government center as he envisioned. Today this block of W. Market Street is renamed the Robert D. Orr Plaza. On the right is Indiana Government Center North, originally constructed in 1960 and remodeled and expanded in 1993. On the left is Indiana Government Center South, finished in 1990. The Indiana State Museum, located in White River State Park, is visible in the distance. 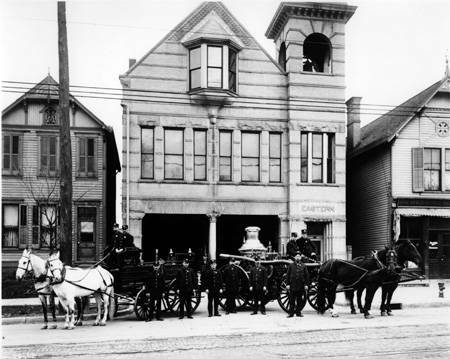 Thanks to J. Parke Randall for letting us scan many photographs from his extensive collection. Please contact us if you would like to share interesting views of Indianapolis, including street scenes, houses, businesses, churches, schools, clubs, parks, transportation, and whatever you find interesting. Not yet, Steve. After it is cataloged it will be posted of the Indiana Memory website. Follow the Indiana Album’s Facebook page to keep posted on our progress. I remember that 1950s view so well! My brother-in-law worked at Acme Evans and my husband worked (in the early 1960s) for the State Highway Dept (now INDOT) in the building on the right. It was their materials and test lab before it moved out east to Shadeland Ave and Washington St.
100 E Vermont is now a parking lot, but just last week I discovered the existence of what must have been the Essex Building while perusing old aerials on Indy Maps. 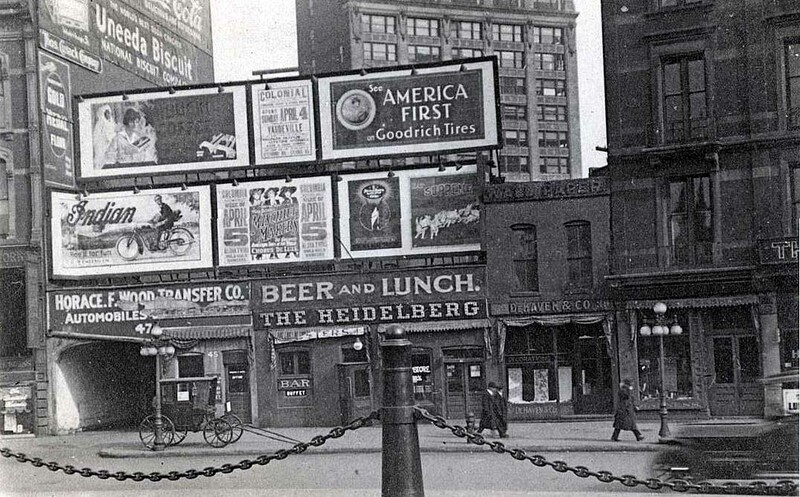 Crazy to think there had been a 15 story building on the site of a current day parking lot. I plan to write an article about the Essex House Apartments. What a shame that it only survived about 40 years before demolition. The city requested new construction by the late 1990s, but the owner has received a few extensions. 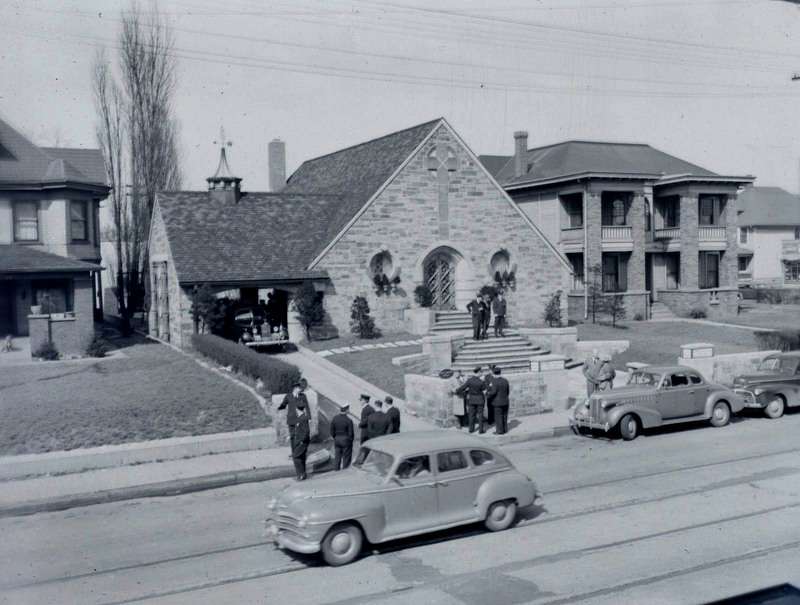 The Essex House was a terrible loss; undermined the feeling of enclosure in University Park. I agree, Doug. I think the city should work a little harder to get the Essex replaced and stop giving extensions to the owner. I remember this silo scene well. In 1954 I took my behind-the-wheel drivers test from the State House Annex office. I started by driving to the end of Market, made a left turn, then 3 more left turns back to the Annex where I parallel parked. The old gentleman testing me informed me that I illegally failed to stop at the silo end of the street, but he passed me anyway. That was a life changing event.